China-Russian Treaty of "Friendly Cooperation"
Following a recent meeting between the Foreign Ministers of China and Russia, Russia’s Foreign Minister, Sergei Lavrov said that the two countries have developed a new pattern of bilateral relationships featuring a mature, trustworthy and reliable partnership. The two countries have signed a treaty of friendly cooperation and have solved the border issue which bedevilled relations between them for years. 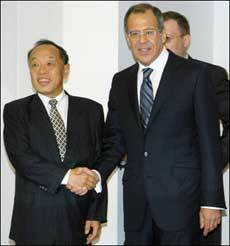 China has become a new pole in international relations, said Lavrov. Russia is not worried about the "peaceful rise" of China, he added. "As permanent members of the UN Security Council, Russia and China bear a special responsibility for international and regional peace and security. The expanding cooperation between the two countries is of great significance in safeguarding global stability. "Russia values cooperation with China on international issues, in particular UN reform, arms control, preventing proliferation of weapons of mass destruction, resolving ‘hot issues’ and ensuring security of adjacent regions for the two countries", he said. He stressed the importance of cooperation with China in seeking political and diplomatic solutions to the Iranian and Korean nuclear issues. Lavrov said that the Shanghai Cooperation Organisation (SCO) has developed into a strong group that can safeguard its own interests and regional security and stability and is playing an increasingly influential role in international and regional arenas. The SCO, established in 2001, groups Russia, China and four Central Asian states — Kazakhstan, Kyrgyzstan, Tajikistan and Uzbekistan. Russian Foreign Minister Sergei Lavrov (R) shakes hands with his Chinese counterpart Li Zhaoxing during their meeting in Vladivostok.